We would like to thank Joel Gagne for volunteering to make this video and sharing his creative talents with us. Are you 16-29 years old and looking to make a difference in your community? Join our volunteer team at the North Bay Regional Health Centre! A completed volunteer application must be submitted by April 15 to be considered for summer volunteering. In addition to youth volunteer placements, we also offer the LEAD program during the summer months. LEAD is a summer volunteer program for youth aged 16-29 that offers a unique opportunity for personal growth and professional development in the healthcare sector. 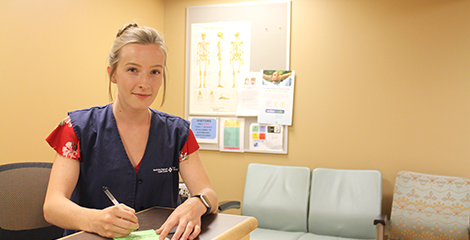 This program is designed for youth who are available to volunteer during the summer and are interested in meeting new people, learning new skills and giving their time to make a positive impact at our Health Centre. This program combines a volunteer placement with learning opportunities geared toward youth who are interested in healthcare. LEARN valuable skills and gain real-world knowledge of the healthcare sector. EXPERIENCE hands-on volunteer work in a healthcare setting. ACCOMPLISH goals to make a positive impact at the Health Centre. DEVELOP personal strengths and build confidence and connections for the future. A completed volunteer application must be submitted by April 15 to be considered for the program. Volunteers who successfully complete the program will receive a certificate of completion. Check out our brochure (to the right) and find out what some of our youth volunteers have been up to!